The Phoenix 1200 Desiccant Dehumidifier offers 900 CFM of ultra-low grain process air in a user-friendly, portable unit. 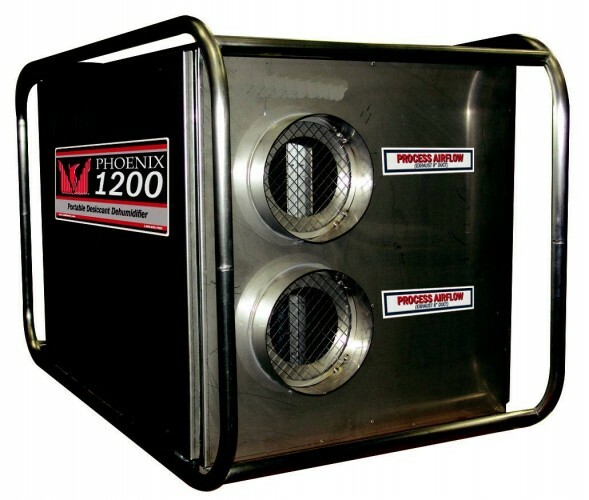 The 1200 is capable of removing 344 pints (43 gallons) of water per day at AHAM conditions, making it an ideal unit for large residential and commercial losses. With its wide operating range and multiple ducting options, the unit is also ideal for basements, crawlspaces, and specialty drying situations. The Phoenix 1200’s robust construction is designed to withstand the rigorous conditions of the restoration industry. The unit is constructed primarily of stainless steel for maximum strength and corrosion resistance. Its compact foot print and light weight allows you to place up to three units into a large SUV or van. This desiccant dehumidifier has been designed from the ground up for simple, quiet, reliable operation under the harshest conditions. The Phoenix 1200 offers both a constant-run mode for maximum drying and a humidistat controlled mode for sensitive jobs. 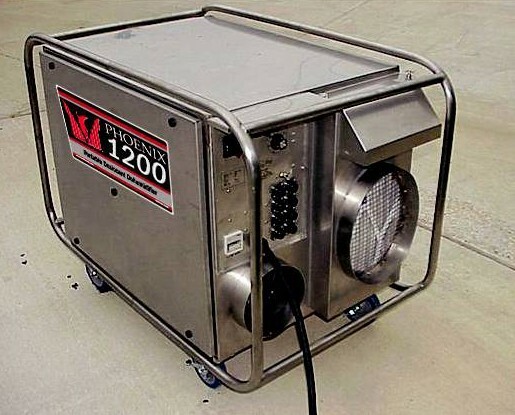 Using 230 volt power for dehumidification – with a user-selectable 25 or 40 amp draw – the 1200 leaves all the standard 120 volt outlets available for your Phoenix air movers. Its dual 8” process outlets allow you to run dry air to the interior as well as an attic or crawlspace. The filter is external for simple replacement. Portable, reliable, easy to use, the Phoenix 1200 is the perfect addition to any restoration professional’s drying arsenal.